Discoverability is a hot potato these days. Number of apps in the various appstores are growing, number of mobile web sites is growing too and more and more people are using search engines, like Google Mobile, to find the stuff they are looking for. I think web search performed from mobile devices is not getting all the buzz it deserves. Here is why. Google is investing much time and efforts into mobile search these days. Putting “Mobile First” they try to make the search on mobile as relevant as possible to the end user. Yes, this means googling on your mobile will give different search results than googling from a PC. Different rules apply. That means that “your regular SEO tricks” you use on your desktop web site won’t necessarily work on mobile. In a mini-series of two posts I will cover what mobile search means for your business (part 1) and how to optimize your web site for mobile search, Mobile SEO (part 2). 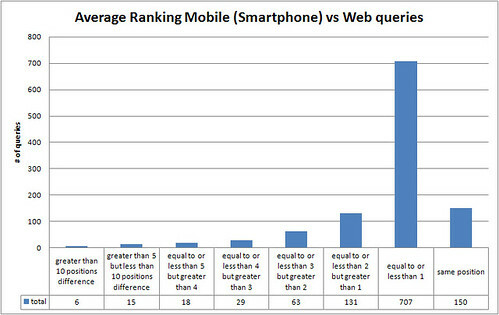 How big is mobile web search? There are no good studies with real numbers describing how big mobile search is. Google won’t tell us anything else than “Mobile search is growing fast”. There are however, a few bits and pieces we can put together to give an estimate to illustrate the impact of search on mobile and the importance of mobile SEO. First, it is quite safe to assume that Google has 100% of search on mobile (same for payed search) for this experiment. Next, comScore reported in January 2010 that Google accounted for close to 90 billion searches per month in December 2009. This was a growth of 58% year over year. Let us assume mobile searches is included in these numbers. Even if Google says that mobile searches grew 130% during 2009, lets simplify and say that all of Googles search traffic grew by 58% also during 2010. Then the number of searches is 138 billion. So, how many of these searches comes from a mobile device? Searchengineland.com quotes Google and says that mobile accounts for 15% of all search volume. Then the number of web searches performed from mobile devices per month is a whopping 20,7 billion. 690 million searches per day, 29 million pr hour. These numbers are probably way too conservative, knowing that Mobile search is growing faster than search form desktop computers! It goes without saying that being visible in search results on a mobile device is important. Why is it important to be visible in mobile search results? However, equally important, or even more important, actually; have a mobile optimized web site ready! More and more end users reaching out to you online, are doing it using a mobile phone. According to Google, and their recent study “The mobile Movement: Understanding Smartphone Users” (*), 81% browse the Internet, 77% search, 68% use an app, and 48% watch videos on their smartphone. Further, Google also says that every third search from a mobile device, has an intent of finding something locally. So, the users context is key; location. Users are searching for flower shops and restaurants, not long wikipedia articles about or stock prices. They need to buy flowers for their date, and find a restaurant to take her/him. You know what I mean. But wait! This is commerce! This is actually driving people to spend money in your store! Nine out of 10 smartphone searches result in an action (purchasing, visiting a business, calling etc.). Marks & Spencer’s mobile site has even taken single purchase orders exceeding £3,000! How to take part in this growth of m-commerce? Well first you need a web site that goes well with you mobile users device, whether it is a mobile phone or some kind or a tablet. Google found that only 21% of Google’s largest advertisers have a website that is optimized for mobile. That’s 79% serving up a less than ideal experience for their mobile customers. It is no use presenting your users with a huge site with lots of flash on it. 21,7 bill searches from mobile phones. Mobile will continue to increase its piece in the search pie chart. And it will happen faster than most think. Users want and are capable of using their mobile phone to purchase or to do research before purchase. Most advertisers on Google does not have a mobile optimized user experience and are missing out on this huge opportunity. As local is so important in mobile search, it makes sense for smaller, local “shops on the corner” to take on mobile too. Next post will cover a few tricks on how to get visibility in mobile search results. *) This study featured 5,013 US adult smartphone Internet users. Smartphone penetration is about 30% globally, and in US.